The college recruiting season is over so now it’s time to move on to next season. Since spring practices and summer workouts are still a few weeks away and with the new college football season a mere 196 days away, I think that means it’s time for one thing. 4 Down Territory Way Too Early College Football Playoff Prediction. So here goes nothing. The defending National Champs return 16 starters (7 offense, 7 defense, 2 special teams) with 7 for each side of the ball. As of right now, Urban Meyer has 3 ridiculously talented quarterbacks on the roster in Braxton Miller, J.T. 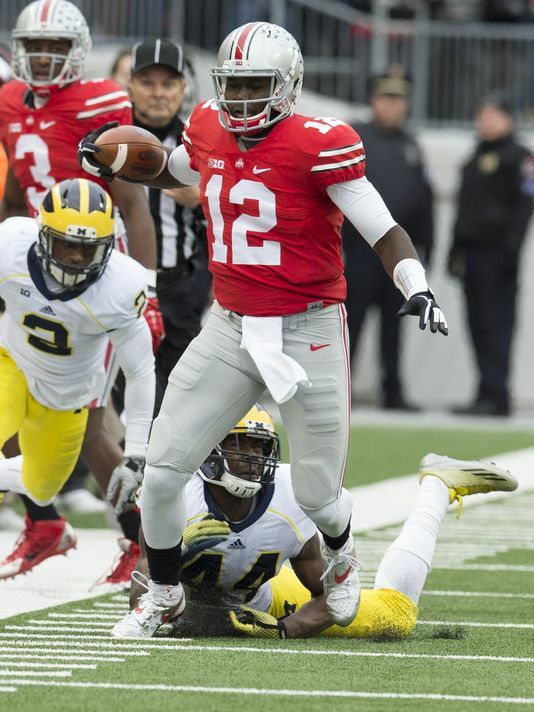 Barrett and Cardale Jones. Rumor is Miller is going to transfer, but for now he is still in Columbus. Ezekiel Elliot returns after rushing for more than 1,600 yards and will be a preseason Heisman favorite (as will whoever starts at QB). The Buckeyes also return four starting offensive linemen as well as three of the top 4 receivers. The offense should be as explosive as ever. The defense has a couple of key losses in DT Michael Bennett, LB Curtis Grant and CB Doran Grant, but if you know Urban Meyer, then you know he recruits extremely well and should be able to plug in a talented player to fill these guys’ spots. Plus, the offense should be able to outscore anyone, giving the defense time to catch up to the offense by season’s end. Ohio State should have no trouble navigating the Big Ten and find themselves in the National Title picture again this upcoming season. TCU returns 18 starters (10 offense, 6 defense, 2 special teams) including 10 starters on an already dangerous Horned Frog offense. Trevone Boykin returns to lead what should be one of the top offenses in the entire country and unless something goes terrible wrong will get an invite to New York City with a shot at the Heisman Trophy. The last game out TCU torched the Ole Miss defense in the Peach Bowl to the tune of 42 points. The defense loses LBs Paul Dawson and Marcus Mallet, which really hurts in Gary Patterson’s 4-2-5 defense. Even with lots of holes to fill on the defensive side of the ball, TCU should win any shootout that they encounter. Honestly, I have this spot as a tossup between TCU and Baylor. Both teams are probably deserving of being in the playoff, but I think it is going to be very difficult to get 2 teams from the same conference in the playoff. TCU gets Baylor in Fort Worth, so advantage Horned Frogs. TCU gets the win in that game and finds itself in the playoff. The Trojans had a string of bad luck in the 2014-15 season. Three of their four losses were by six points or less. Sometimes the ball just doesn’t bounce your way. The ball certainly did bounce the right way however for Cody Kessler, who returns for his senior season. Kessler competed 69.7% of his passes for 3,826 yards, 39 touchdowns and only 5 interceptions under first year coach Steve Sarkisian. I expect more of the same from Kessler next year and consider him a dark horse Heisman candidate. USC returns 16 starters (8 offense, 7 defense, 1 special teams) but has some major holes to fill after losing Leonard Williams to the draft. 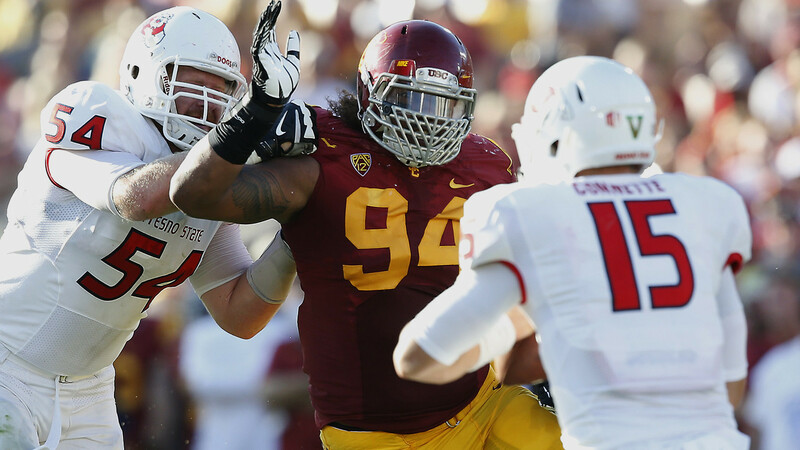 DE J.R. Tavai and FS Gerald Bowman are also key losses for the Trojan defense. USC has put together solid recruiting classes however and shouldn’t have a problem replacing Tavai and Bowman. Williams is another story, as he is the number one player on most people’s big board for the NFL Draft. Regardless, I expect the Trojans to be a little more fortunate and able to pull out those close games this year and find their way into the playoff. Before you go whine and complain about how terrible a prediction this is and how it is a homer pick, let me stop you. It absolutely is. But, I also think the Tigers have a legitimate shot at getting into the playoff, so hear me out. Think about this for a second, Auburn was a botched snap at the end of the Texas A&M game and a complete 4th quarter collapse on defense in the Iron Bowl from being 10-2 last year. If that happens then this pick doesn’t sound so crazy. The schedule is brutal (like most SEC teams are) but compared to last year it will be like a nice stroll down the sandy beaches of Gulf Shores instead of running through the gunfire on the beaches of Normandy. Yes the same teams are there but Ole Miss, Mississippi State, Georgia and Alabama all make trips to the Plains. Louisville in the opener in Atlanta and trips to Baton Rouge, Fayetteville and College Station will be no small feat. Still, Auburn returns 14 starters (5 offense, 7 defense, 2 special teams) with 4 of the 5 offensive linemen returning. Jeremy Johnson should bring a different element to the Gus Malzahn attack and put up big numbers. Duke Williams returns and provides Johnson a playmaker on the outside. JUCO transfer Jovon Robinson and sophomore Roc Thomas should be an excellent 1-2 punch in the run game. Will Muschamp will be a major upgrade for Auburn on the defensive side of the ball. The Tigers were just flat out embarrassing the last half of the season and need a hard-nosed, fiery guy like Muschamp to fix it. Even a slight improvement on the defensive side of the ball should yield major dividends for Auburn. The Tigers have recruited well, finishing in the top 10 the last 4 or 5 years. The question remains: can Malzahn, Muschamp and company develop that talent?